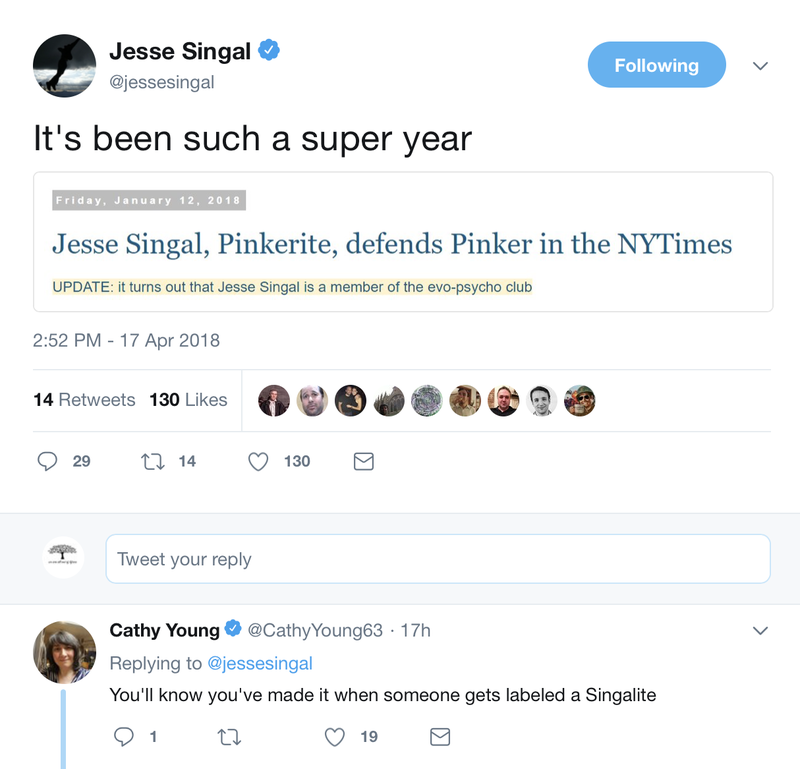 Heavens to Mergatroyd: Jesse Singal is still a lazy half-wit "journalist"
Jesse Singal is still a lazy half-wit "journalist"
No surprise to see that one of the fans of lazy half-wit "journalist" Jesse Singal is right-wing Koch brothers hack Cathy Young. I was amused to read the comments in this thread, although not because the commenters were deliberately funny. Much like Singal himself, his Twitter followers are, try as they might, wit-less. Almost none of them seems capable of actually reading what I've written about Pinker and his evo-psycho bro followers, or understanding it. But then, you really can't expect intellectual rigor from people who are impressed by Steven Pinker. 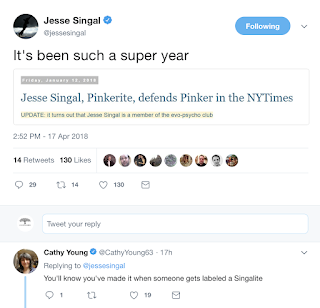 It actually has been a super year for Jesse Singal - he's under-qualified to be a journalist and yet he gets paid to write. He should count his blessings. With any luck Singal will screen cap this too and post it on Twitter and we can keep it going - I'm happy to keep adding to the "stories about Jesse Singal" collection.